Monday, April 1 2019- Western Sizzlin Restaurant on West Sunset Ave-Springdale AR. 2018 was another great year for Bikes on the Bricks! 104 beautiful vintage motorcycles in the Show! A big thank you to all of the club members and friends who worked the show! A big thank you to all who participated and brought out all the great bikes! A big thank you to all who attended the show! We will be posting the 2018 winners list as soon as time allows, thanks for your patience. Who all won in 2017? Click Here for the winners list. The OVMA is seeking new members! If you have an interest in vintage motorcycles of any type, then this is the club for you. We welcome members with modern bikes, members with no bikes, all you need to do is like bikes. Come out to our next meeting, and see what we are all about! was formed to sponsor and promote activities for the preservation and enjoyment of vintage motorcycles. We are a non-profit corporation and meet the first Monday of each month in the Northwest Arkansas area. The OVMA is managed by a board of directors who are elected by members. Membership is open to any individual that has an interest in vintage motorcycles. 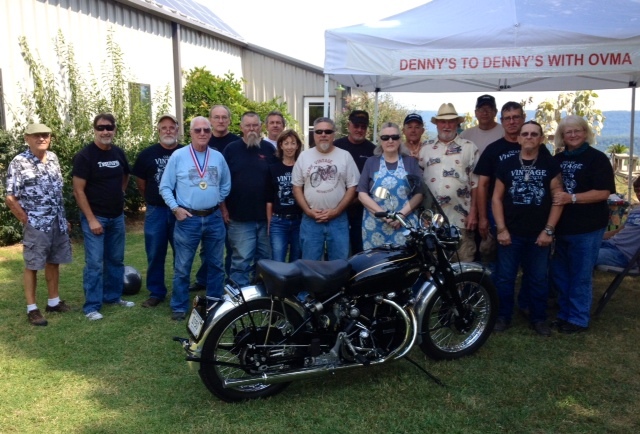 The mission of the Ozark Vintage Motorcycle Association is to encourage and develop motorcycling for the benefit and enjoyment of its members. Our objectives are to encourage the ownership, collection, preservation & restoration of any motorcycle, organize rallies, shows, displays and other events, and to provide an organization to carry out services required by its members. We sponsor rides, runs and swap meets, as well as vintage motorcycle shows throughout the year and invite interested vintage motorcycle owners to join our association. For any questions or gripes about this site,call or email me.